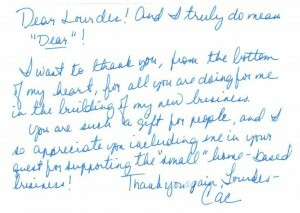 I received this very gracious note from one of my friends and ladies that comes regularly to our Luncheons, Cac Stiner. Honestly, this note made my day. Let me tell you a little bit about Cac that you may not know, she is a hard-nosed, get it done “yesterday” sort of business woman who has been successful in business in various industries. She is a natural entrepreneur. In short, she doesn’t need my help or anyone else’s for that matter to be successful. But she knows, that with help from other business people, she’ll get “there” faster and more efficiently. This note is something that “we all” collectively earned. All I have ever done is try to be the catalyst and provide an environment in which business can occur. The rest is up to all of us. Clearly, all of you have welcomed her, like you always do, to help her to build her business and I appreciate that. Sometimes the kudos I have received for the Luncheons makes me uncomfortable. I am not a saint. I have a passion for business and in watching people succeed, yes, but know that I network at my Luncheons and elsewhere because it’s good business. I have received so much more than I have ever given from the Luncheons in business and, most importantly, friendships. 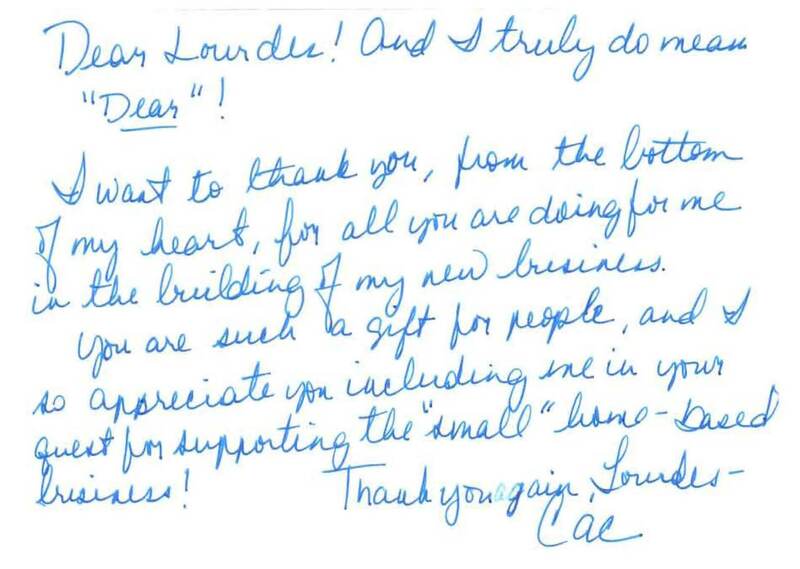 So Cac, the thank you, really goes to you for taking the time to write such an uplifting personally hand-written note For those of you wondering here is Cac’s website. So I do these Luncheons, of course, to benefit myself personally. But what really keeps me going, truly, is when you let me know what I’m doing is worth it, for all of us. Thanks for sharing this, Lourdes! You deserve all the kudos you receive… See you next month! Thank you for your kind words. I can’t wait to see you agai next month. I love all of your work. Very impressive by the way!